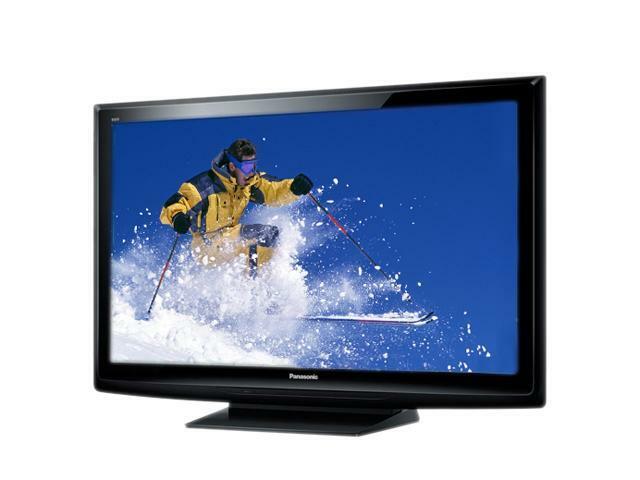 Break into the world of HDTV with this affordably priced Panasonic TC-P46C2 46’’ Plasma HDTV. Experience the brightness and clarity that can only come from a plasma screen. The 600Hz sub-field drive offers crisp, focused images during fast-moving scenes, making the TC-P46C2 perfect for watching action-packed sports, shows, and movies with the family. Whether your dream is watching a football game, hosting movie night or creating an out of this world project report, this TV will deliver. With surround sound, you will hear every thud of players colliding and every note of the background music. View full-HD images stored on your SD card on the large HDTV. Control all your compatible devices just with a single remote. Panasonic brings every color to life for an incredible window to the world. With their VIERA C2 Series, you get an entertainment center for today and tomorrow, designed for your home! Make your life easier with the VIERA C2 Series 46" Plasma HDTV from Panasonic! HDTV Ready The widescreen Panasonic VIERA TC-P46C2 fully supports up to HDTV 720p (1024x768 Native Resolution) for a truly high-definition experience. 600Hz Sub-field Drive 600Hz technology lets you view superb HD motion and still images. For even greater clarity with motion images, Panasonic uses its own unique image-analysis technology. This technology converts the motion in each scene into dots. And each frame is practically displayed for a shorter length of time than in previous systems, to reduce aftereffects. 2,000,000:1 Dynamic Contrast Ratio The Panasonic VIERA TC-P46C2 delivers a new height of contrast and brightness up to 2,000,000:1 for more realistic, sharper picture quality and ensures accurate color reproduction and displays every scene in drop-dead gorgeous detail. VIERA Image Viewer VIERA Image Viewer enables you to pop your SD memory card into the built-in slot of the TV and view your digital photos in the memory card, perfect for sharing photos with your friends and family. VIERA Link The VIERA Link allows you to use only one single VIERA remote control to operate various compatible AV devices interconnected by an HDMI cable. Built-in ATSC Tuner Armed with a built-in ATSC tuner, the Panasonic VIERA TC-P46C2 displays digital over-the-air programming without additional digital set-top equipment. 30.4" x 44.6" x 14.1"
28.5" x 44.6" x 3.7"
Other Thoughts: ... For general family viewing, this is a great entry level HDTV. Panasonic is a leader in the plasma television field and they didn't skimp on picture quality on this one. ... For audiophiles, you'll want external speakers - the internal speakers are good but not great. ... For technophiles and gamesters, you might be better off paying the extra bucks for a true 1080p set. Ditto for folks enraptured with extra hi-fidelity Blu-Ray movies. ... And for those folks that are easily distracted, go to your nearest showroom and compare the LCD's and LED's against the Plasma's before purchasing any Plasma TV. ... Do your homework and research the competition. I did and I'm very happy with my purchase. Pros: Good size, good picture, simple menus. Best of all -- the price. Cons: Like all plasma screens, the glossy screen reflects a bit. Not a big deal though. Other Thoughts: Newegg has great Customer service. Pros: Good price, but I have not taken delivery yet, so will review later. Other Thoughts: Just ordered today on newegg to take advantage of the 10% coupon code that expires today. I am nervous b/c there are no reviews on Panasonic Viera TC-P46C2 anywhere on the web (except one guy on @mazn that seems very basic). I don't think the widely known Viera Black Level problem applies to this screen, and can find nothing about this particular set on the AVS forum. I can't believe no one else has bought this model - for the price and advertised features it seems like a good deal - or if anyone has, why no one has reviewed it. Anyway, I am offering 5 eggs only because I have had many years of good experiences with newegg, not because of anything about this TV, and I reserve the right to modify this review in a month or two when I have actual experience with the TV.